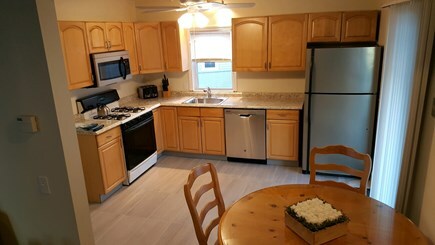 Eat-in kitchen with all conveniences + beautiful ocean breezes! Living room with TV, ocean facing windows and A/C unit. 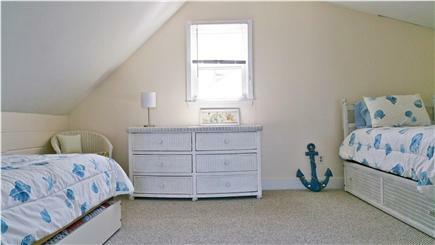 Downstairs bedroom sitting area with ocean facing window. 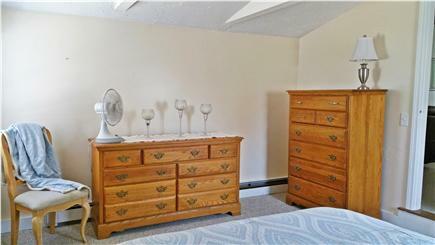 Upstairs bedroom with two twin beds with trundles and A/C unit. View from upstairs loft going out to balcony. Bathroom with shower and over-sized tub. A small yard area for lounging in the sun. Brant Rock beach looking northwest towards Ocean Bluff. Brant Rock beach looking southeast towards Green Harbor. 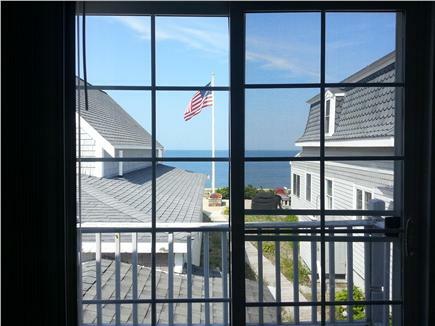 Nestled on Brant Rock beach (just behind our larger oceanfront rental home #20156), your little slice of heaven awaits. A sunny farmer's porch with cushioned chairs greets you on arrival. When you enter through the sliding glass doors into the fully-equipped eat-in kitchen, you'll immediately feel the cool of ocean breezes or the A/C units and ceiling fan. The living room has a partial cathedral ceiling with ocean facing windows, a new leather couch with recliners, a soft side chair, plus a new large TV with cable and free premium channels. Past the living room, a spacious bedroom with a queen bed, and A/C unit, and an ocean facing window. 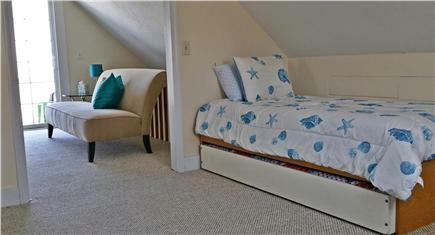 Up the spiral staircase, enjoy a loft sitting area with a view of the ocean through the slider door. Open the slider door and step out onto the small balcony for all-day sun and gazing out at the water. Back inside, opposite the slider, is a large bedroom with two twin beds, each of which has a pull-out trundle, sleeping four total and a large closet. Back outside is a small yard area with grill, chaise lounges and Adirondack chairs and a walkway up the side of the larger house to your own private deck right at the seawall. 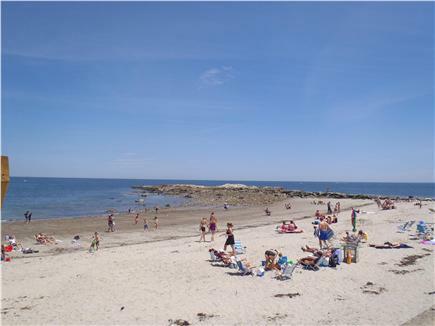 Brant Rock Beach is a large public beach with a trove of sea life and treasures in the sand and rocks, plus the tide pools of Brant Rock jetty. Also on the jetty, kids of all ages love to make a big splash from the rocks into the cove on the sheltered side or, for bolder kids, the ocean-side diving spot that we call ''the 20 footer.'' We love to hear what others end up calling it. Featured in the movies 'The Finest Hours' (2016) and 'The Equalizer 2' (releasing August 2018), Brant Rock has everything one could possibly need within a 2-10 minute walk - a market (with produce, meat, a deli and a bakery), five restaurants, an ice cream shop, a fish market, beach shops, a church, the pier, a laundromat and a nail salon - with more expansive shopping and grocery options available less than a ten minute drive away in Marshfield Center. Although we appear to have a cinema in 'The Equalizer 2,' that's actually the Brant Rock Hop restaurant made up with a little movie magic. Another dramatization in both movies is the weather (both are filmed during major storms)! What an amazing find! We showed up early and met the owners, Dave and Shannon. I cannot tell you how wonderful and hospitable this couple was! The house was spectacular and literally 30 seconds from the beach! It had everything anyone could have needed for our week long stay. Tastefully decorated and had wi fi and cable. Also our vacation neighbors were wonderful! Everyone in this subdivision was very welcoming and open arms if we needed anything. We met some lovely families. We didn't want to leave and only left the house to get pizza (across the street) and do laundry (also across the street).